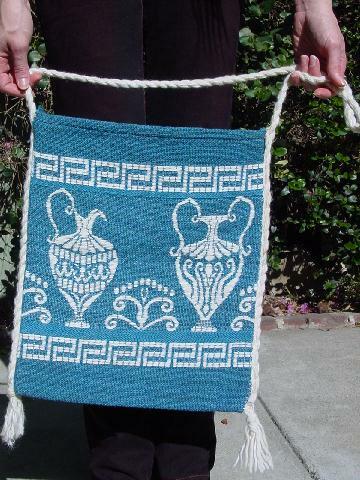 This vintage woven tote was made in Greece. 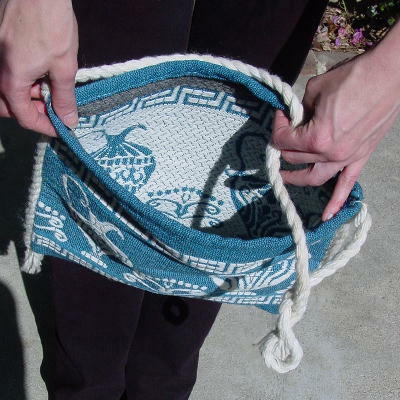 The blue background is made up of several different shades of blue and other colors (medium and dark gray, lavender, azure, turquoise, and baby and Chinese blue). The urn and designs are in a creamy white. There is some yellowing (age discoloration) to the 34" long yarn strap and side trims. You could carry it as a tote or hang it on a nail and display it on a wall. It's from a former European model. She picked it up in Greece while on a location photo shoot.